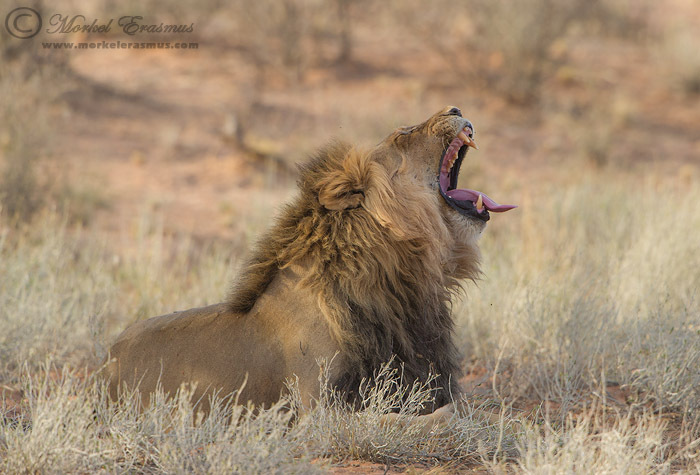 It was a morning much like any other morning in the Kalahari. 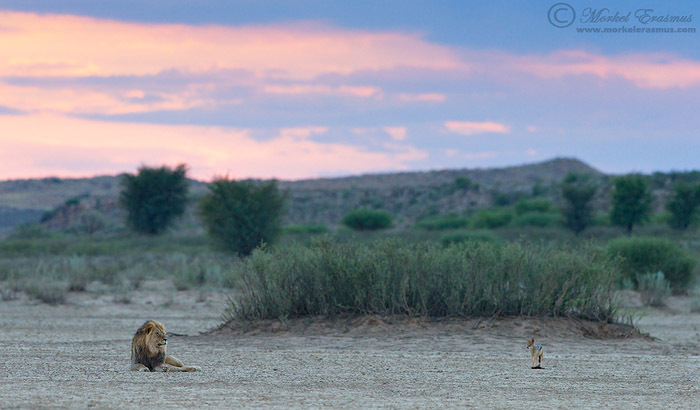 Yet it would turn out to be a morning so unlike any other morning in the Kalahari. Sure, this happens all the time...but rarely does it happen in a setting like this, in light like this and at close range like this...it all came together. Let me start at the beginning...because there are a few key elements to the story which highlights why it all came together so nicely. We had stayed in Twee Rivieren (the main rest camp at the entrance to the Park) for the first 2 nights of our week-long stay, and had been blessed with very good sightings of Lion, Caracal and African Wild Cat. We then headed up the Auob river to stay in Mata-Mata for what should have been 4 nights before we had to return to Twee Rivieren for another 2 nights...but after 2 days we decided to swop out our nights there to return to Twee Rivieren earlier. Why? The Auob river was bone dry. Actually, drier than bone dry. There was very little activity up that way, and we felt our chances for good sightings would be better in the south...and boy would we be glad we returned when we did! 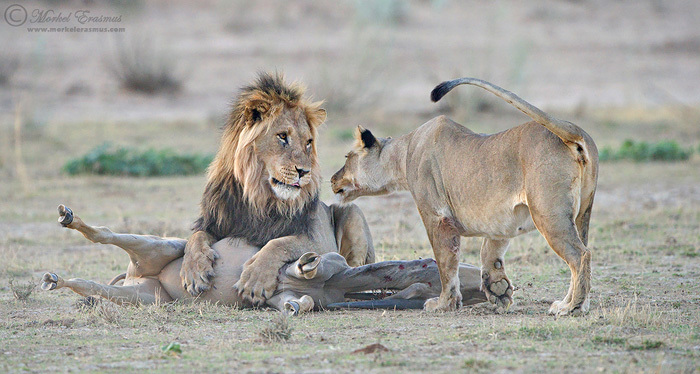 We arrived in Twee Rivieren on the afternoon of the 28th of November, and after doing a short afternoon drive up the Nossob river towards the Leeuwdril waterhole we came across a pride of 5 lions resting under a tree...3 females and 2 males. They were being generally lazy and besides moving up to the dune for sunset, didn't do much at all before we had to leave to make the camp gate closing time. My friend Hendri Venter was also at the sighting, though he was camping at Rooiputs, a camp further up the Nossob from this spot. We actually expressed the hope that they would move south towards the Samevloeiing waterhole and make a kill there during the night. Samevloeiing is a waterhole at the confluence of the dry Auob and Nossob riverbeds, and is about 3km from Twee Rivieren. This spot where we saw the pride that afternoon was about 8km from Twee Rivieren along the Nossob riverbed. 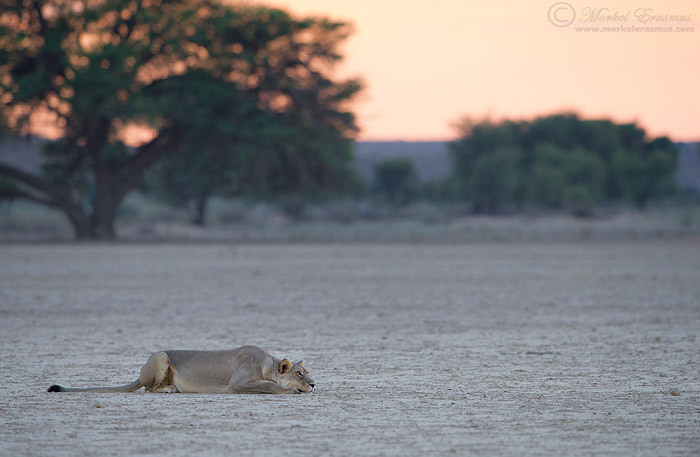 At first I thought it was strange that Hannes had parked so far from where the pride was lying...and then I saw this lioness right on my 3 o'clock! 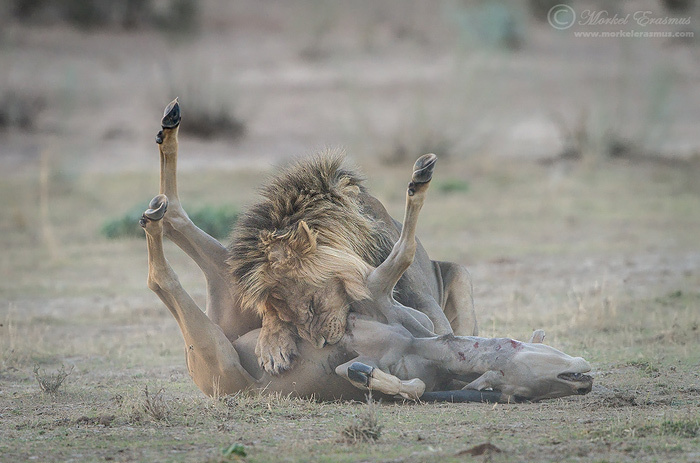 At this point I just knew we were in for something special - whether they make the kill or not - just SEEING this unfold in front of us was a bucket-list experience for me...if things go well we could possibly watch lions plan a kill, stalk and execute it and feed all in the space of one morning! It was slightly overcast on the horizon, so we had nice soft light with a hint of dawn colours - I had to push the ISO on my cameras a bit though! Luckily my Nikon D3s and D800 can handle low light photography very well. 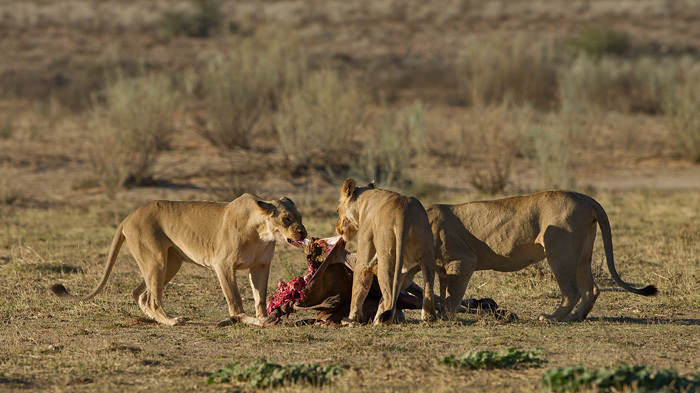 They moved ever closer to us, and to the waiting lions...by this time I was thinking the hunt would not happen. 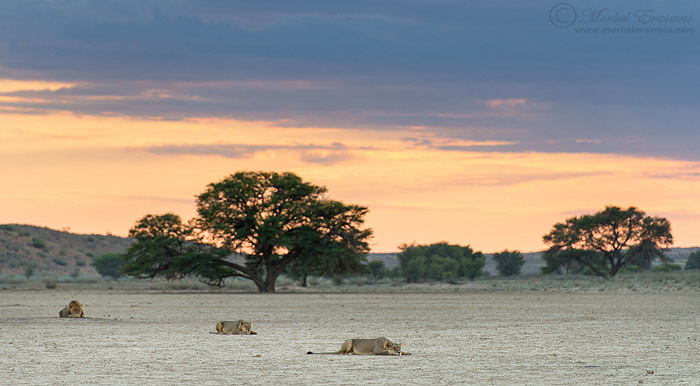 Surely on an open plain like this, with nothing to hide behind, the Lions would be seen by the Eland and they would run away before the Lions could get close enough? Ever closer they came...I saw the opportunity for some unique photos and braced myself to get the timing just right. Shallow depth-of-field, check! I fire three shots off. I just HAD to look at the viewfinder to see if I nailed it. I firmly believe a good photo needs no description, no explanation, it will tell the viewer the entire story, and if possible leave the viewer with more questions. This photo does that - and I view it as one of the best I have captured in my brief photographic career. 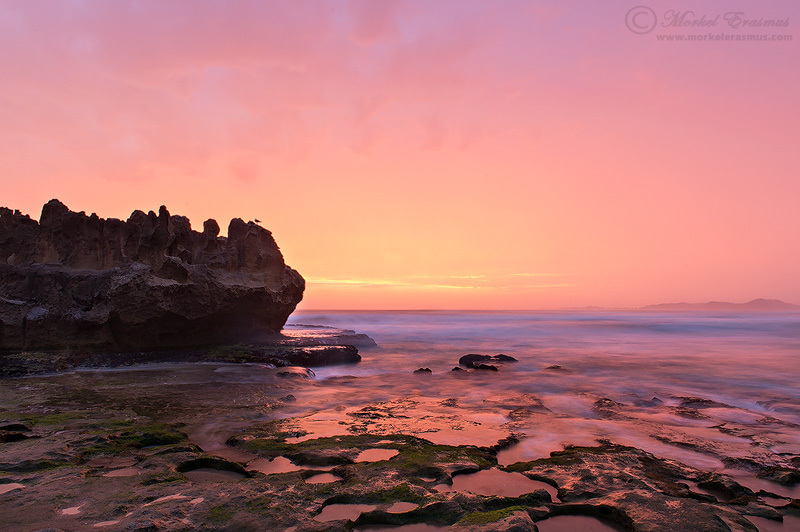 I also included this photo in my "best of 2012" collection posted here on the blog. 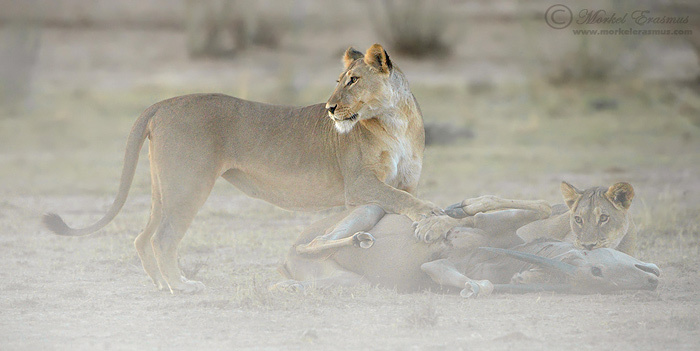 My rookie mistake had cost me the "takeoff" or "launch" of the lioness...but there's no use in crying over spilt milk. There's just something about a lion at full speed. I've captured photos of cheetahs sprinting and running with their lithe bodies, but a lion is different. 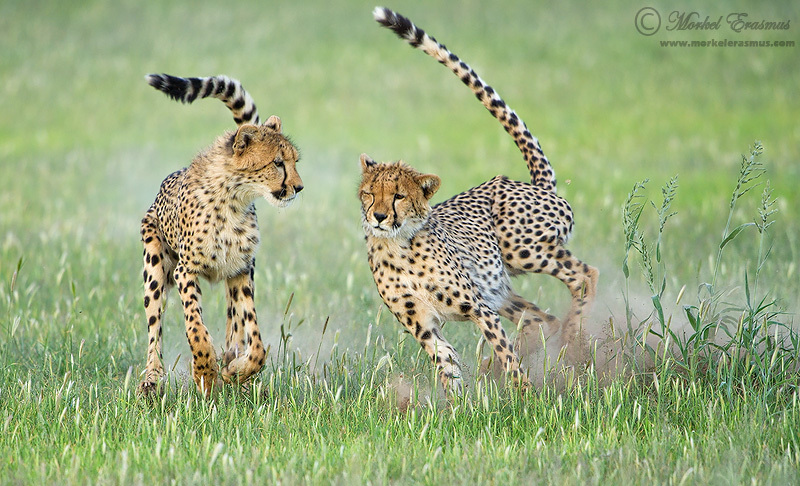 There's a power and presence here that was missing with my running cheetah photos. On a processing note: I found these dust-filled images tough to process so that it shows the correct colour and mood as I remember it. The natural contrast picked up by the camera was quite low so I tried not to boost it too much. 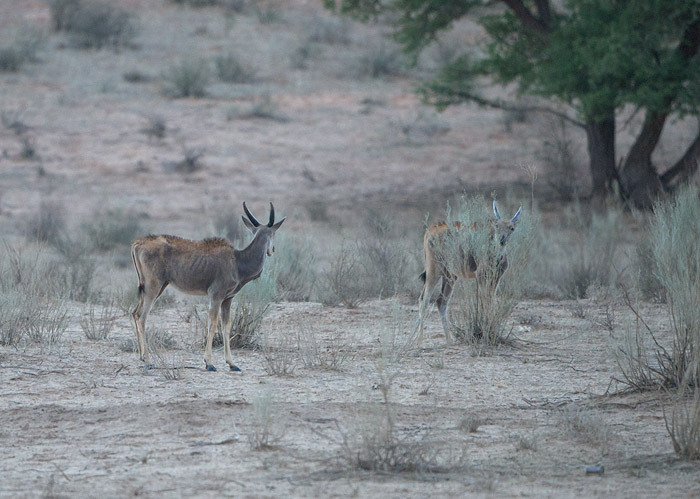 The other male (the sleepy one) had strolled up by now and the two of them started finishing off the Eland. I know these images are upsetting to some, but I do like the fact that there's no real gore and guts involved here yet - just the playing out of one of Africa's oldest dramas. The morning sun started to break through the clouds now, providing some welcome light that added a different mood to the scene. I won't blabber much more. Most of these photos needed no explanation to begin with - but I do love telling the stories of these encounters almost as much as photographing them, so excuse my indulgence. I'll post some more photos and let them speak for themselves. 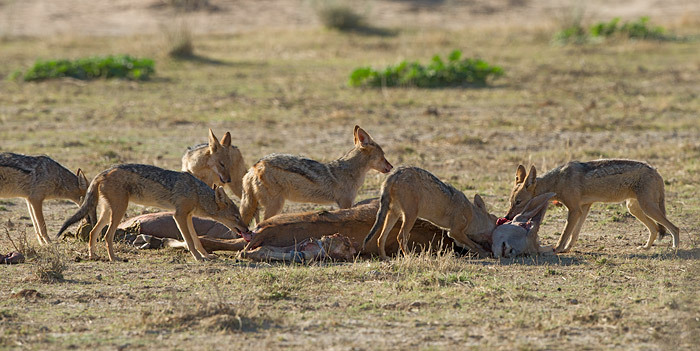 Suffice it to say that the 2 males left very little for the females to eat, and thereafter the jackals took over. 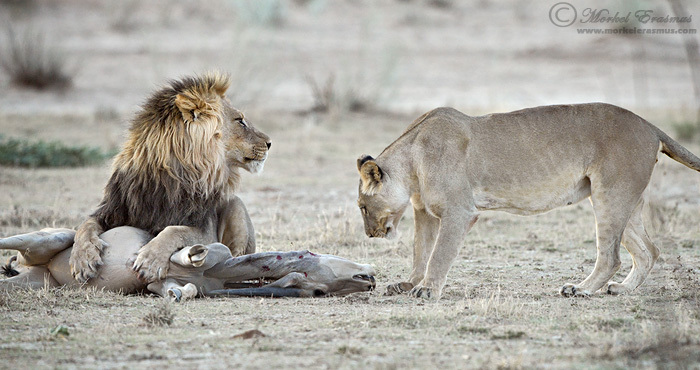 This pride made 2 more kills during the next 2 days but none of them were close to the roads and none of them provided such a sighting for those who were lucky to be there. There you have it! I hope you enjoyed reliving this sighting with me. I'm pretty sure I won't see something as great as this as thorough (start-to-finish) as this for a long time. Can you believe we are sitting in the year 2013 already? Every year feels like it's a flyer, but to me personally, 2012 felt like it went by quicker than any previous year. It's obviously a factor of how busy you are and how much you enjoy every day of your life - if you are discontent in everything you do I am sure the days will seem like they never end. I've not been an avid photographer for very long, but for the past 2 years I compiled a best of post at the end of the year. For some it's a pretty cliche thing to do, but I don't really care, as for me it helps me look back over my photography of the past year, and recall some of the amazing memories that went along with tripping the shutter at specific times and in specific places. Often these memories link me to the adventure that was had, the people I shared it with and the total awesomeness of God's creation that I have the privilege of seeing and photographing. So, as you can guess from the title, this year I am at it again. I quite like how I did it LAST YEAR, so I will try and follow a similar format, showing my Top 5 landscape photos, my Top 5 avian (bird) photos and my Top 10 wildlife photos (since wildlife make up the majority of my photographic focus). Also take note that these are not necessarily the best photos I took this year (who can determine that anyway?? ), they are not even necessarily my favourites (I have not even had time to work through all the photos I took this year properly), but they do epitomize the experiences behind them for me, and that's what I want to showcase. 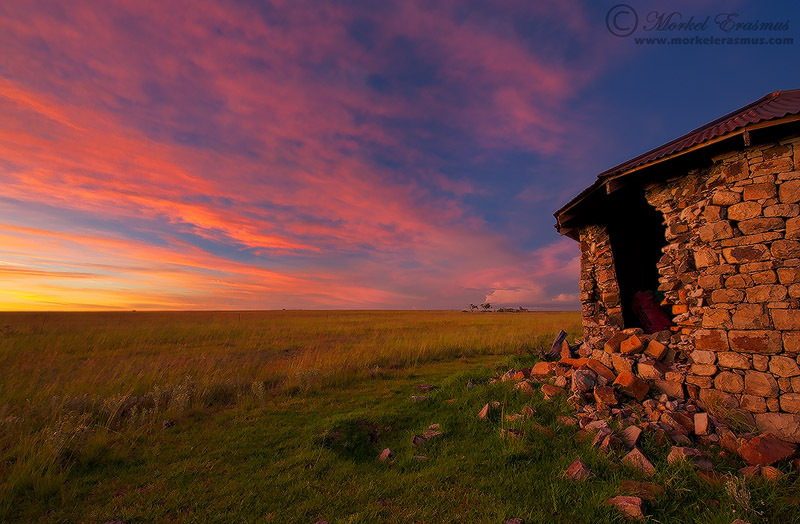 I am grateful to have shared some of these moments with great friends and fellow-photographers like +Felix Reinders, +Marlon du Toit, +Andrew Aveley and +Gerry Van der Walt. 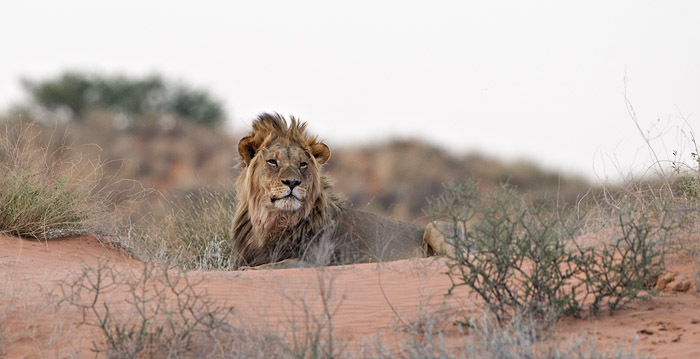 You should know by now that I am really passionate about the Kalahari desert, specifically the Kgalagadi Transfrontier Park. This year we made our first visit in the midst of the rainy season, and found the semi-desert surprisingly green. 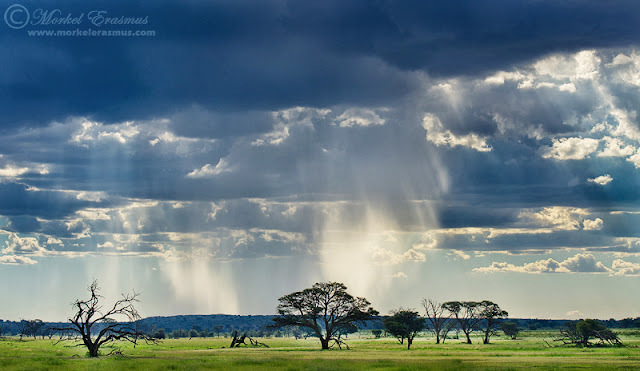 Thundershowers were a daily occurrence, and this one was photographed in a very isolated part of the park as we sat waiting for some wildlife at a waterhole. Camping in Mana Pools National Park on the banks of the mighty Zambezi river in Zimbabwe was one of the highlights of my year. 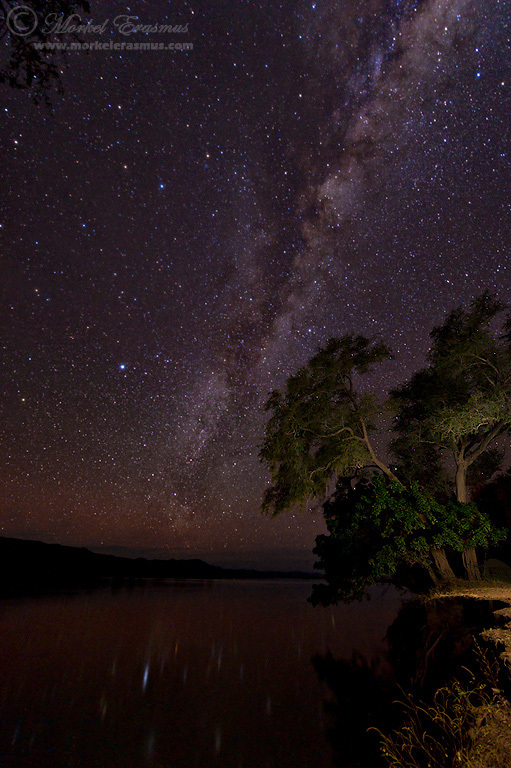 I've never been to a more pristine and more remote place, a last vestige of truly wild Africa. This photo was captured viewing the course of the Zambezi to the west, towards the very far-off Indian Ocean. 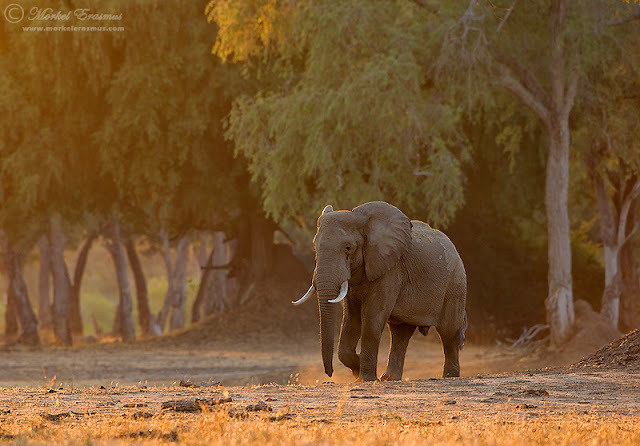 To join me in Mana Pools on a safari next year, click HERE. My last selection for the landscape portion of this overview was taken right before Christmas on the beach of Brenton-on-Sea in the midst of torrential rain and lightning overhead (wouldn't you risk it a bit for this kind of light?). Andrew Aveley, a fellow Wild Eye ambassador, shared this glorious sunset with me. I rue the fact that I didn't explore more compositions, but truth be told I was struggling more to keep my camera and lens dry than I was focusing on changing the composition here. I did not do enough proper landscape photography in 2012, and that's something I hope to remedy in the coming year, as it's something I really enjoy doing. Let's move on to the feathered friends. 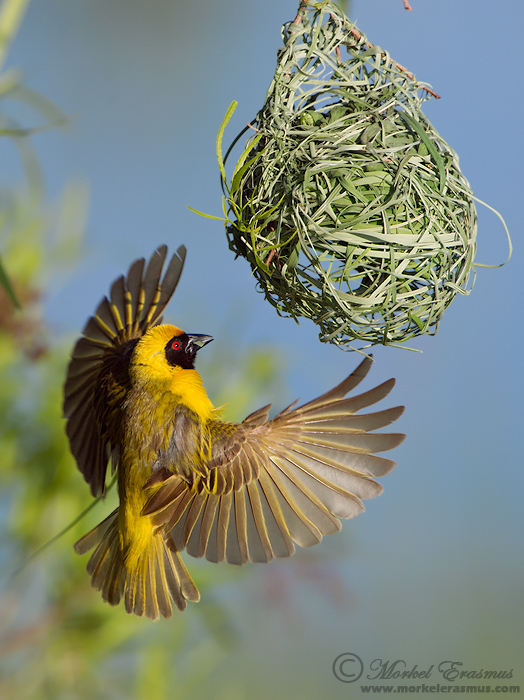 This is a photo I had been wanting for a long time: a Southern Masked Weaver returning to his nest-under-construction with new building material. I captured this photo in the Pilanesberg National Park, South Africa. I had to pre-focus on the nest, dial in enough depth-of-field and keep my non-camera-bound eye open to anticipate his return. 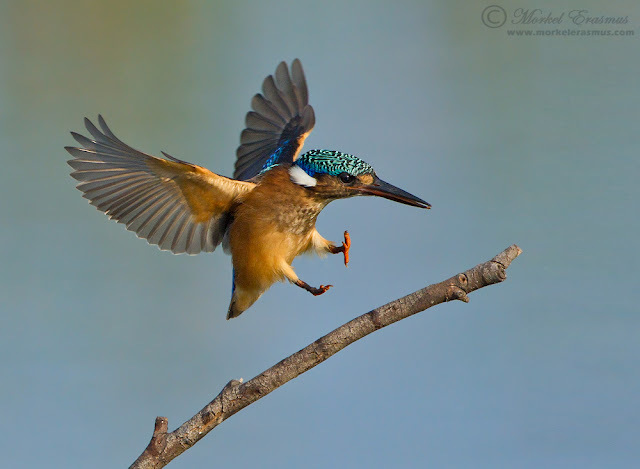 Few South African bird species present as much of a photographic challenge as the lightning fast little Malachite Kingfisher. I was fortunate to capture this frame one morning at the Marievale Bird Sanctuary in South Africa. 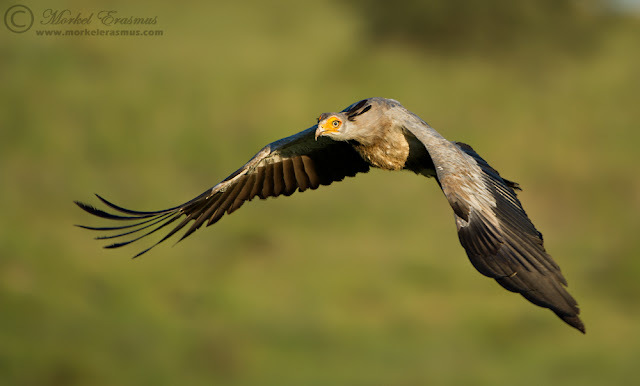 I posted a Secretary Bird taking off in my selection last year too. 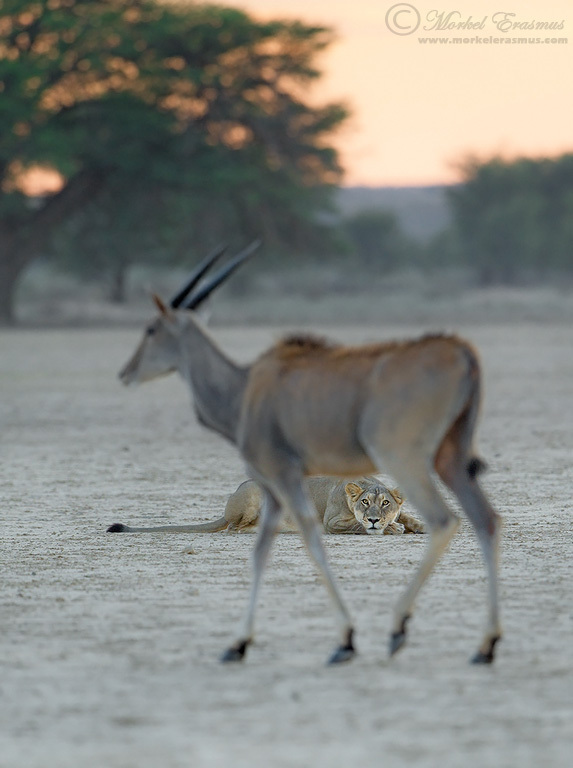 This one was taken in the last light of day in the Kgalagadi Transfrontier Park. The bird was flying right above the South African border with Botswana, coincidentally, at this point. 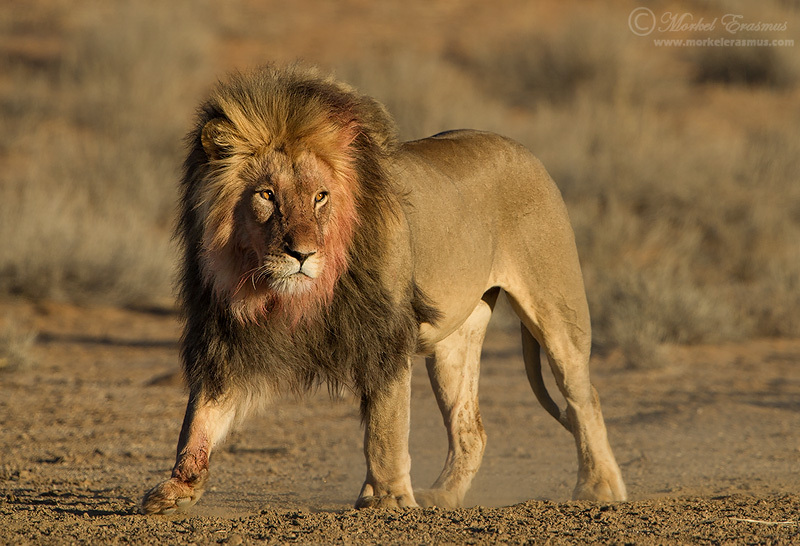 We witnessed a strange phenomenon during our February/March visit to the Kalahari. 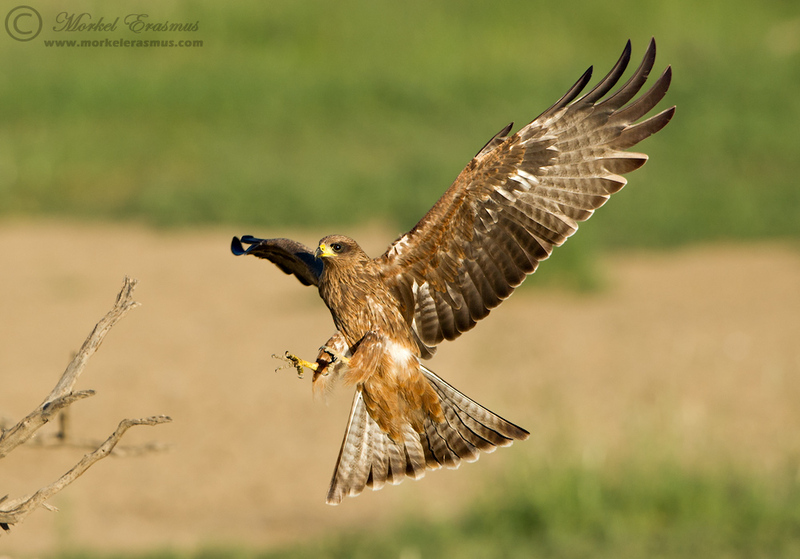 Hundreds of Yellow-billed and Black Kites had congregated in the Nossob riverbed to feed on some sort of termite or insect spawn brought on by the summer rains. It was a joy to watch and photograph them from the Nossob rest camp hide. This is a Black Kite coming in for a landing. 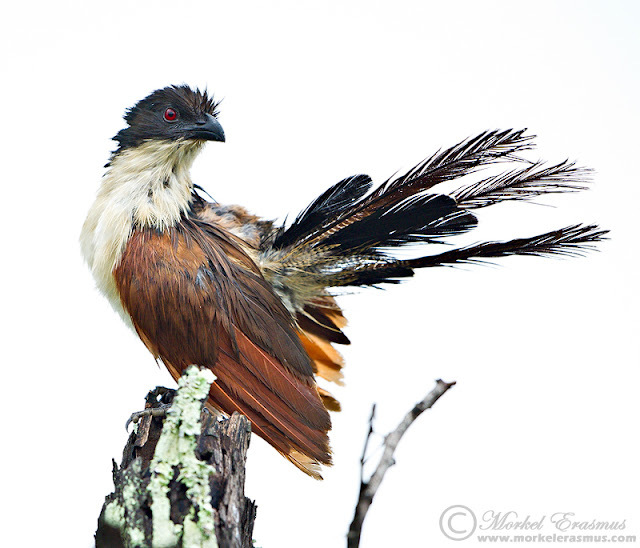 The Burchell's Coucal is normally a secretive bird, preferring thickets and dense foliage - very often heard and not seen. On a rainy day in the Sabi Sands Game Reserve I found this one looking wet and miserable out in the open. I made sure to overexpose for the bright sky behind the bird, and came away with some interesting high-key photos. It was REALLY hard to pick only 10 out of this year's crop of wildlife images. It's been a great year for me in terms of building my portfolio and getting some very interesting images (at least in my own mind - though I hope you'd agree after this post). Again, I am arranging them chronologically as the year progressed, and not in order of personal preference. 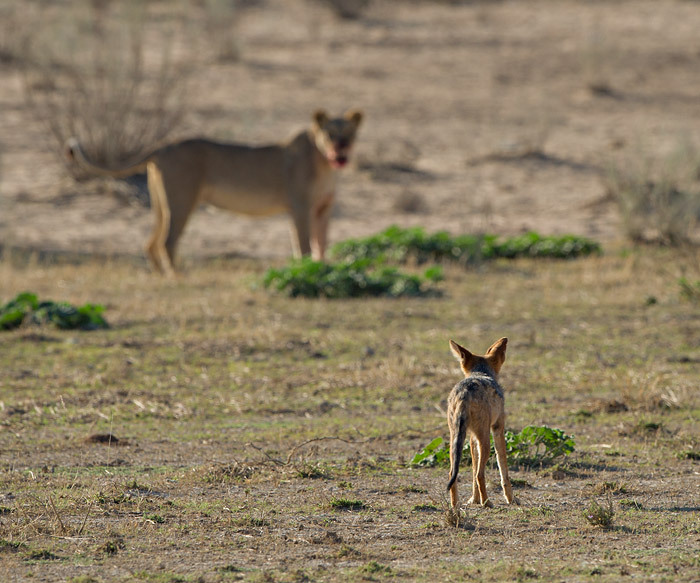 I've been treated royally by the Kalahari cheetahs on my recent trips to the Kgalagadi Transfrontier Park. On this particular occasion, Felix Reinders and I followed a cheetah mother and her 3 adolescent cubs as they walked up the Auob riverbed. 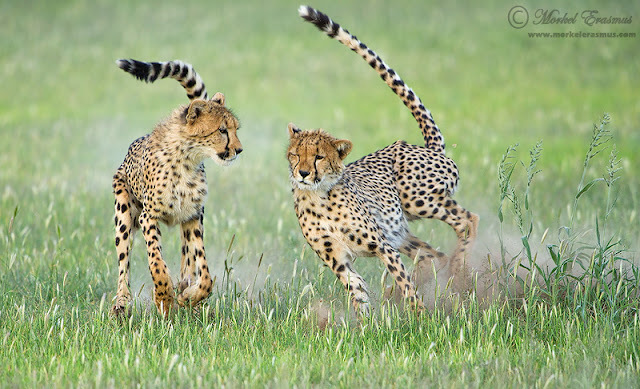 Suddenly the youngsters got a surge of energy and started frantically chasing each other. I ended up with "too much lens" as they hurtled closer at full speed but came away with some keepers. Those who prefer bird photography to mammal photography often bemoan the static nature of much of the mammal species for much of the day. 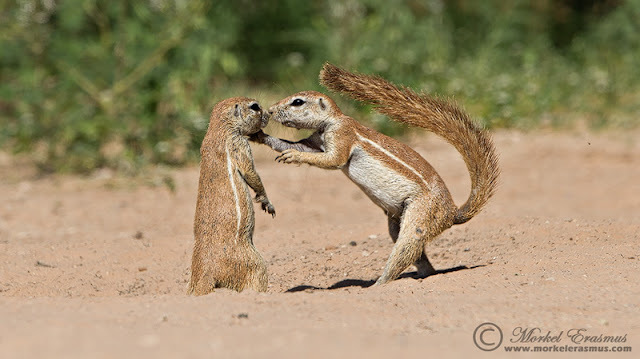 I must agree that one has to be even more patient and have some luck on your side to get good action photos of mammals. The light may not have been the best, but as a sighting this just rocked. 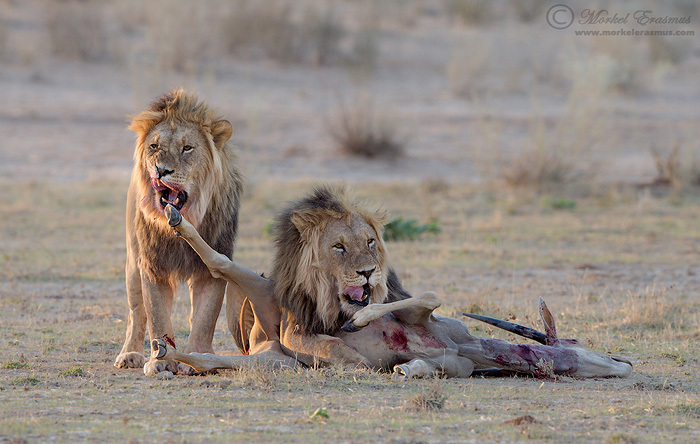 Imagine a coalition of 4 male lions in their prime, kings of their domain, lounging around and surveying their territory. 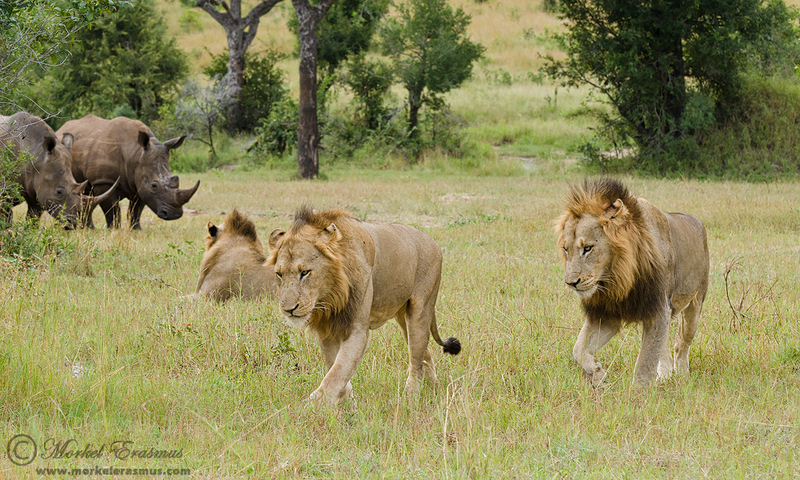 Enter a crash of white rhinos...who smell the lions and come closer for investigation...causing the lions to get up quickly and saunter away disgruntled at having to give up their comfortable resting spot. Moments later the agitated rhino bull chased one of its kids and one of the lions right past us (missing us by meters). Seeing the interaction between these 2 members of the Big 5 was special. You'll inevitably see a few images from this trip in this selection. 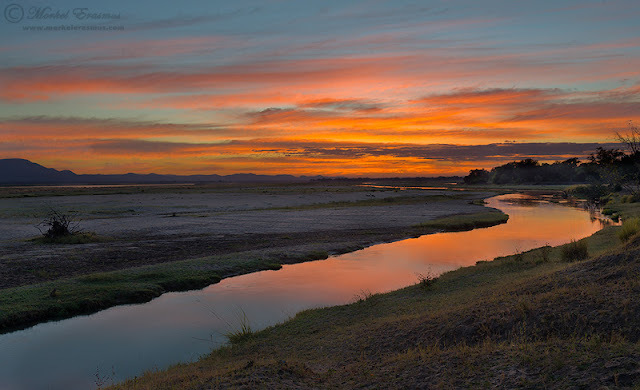 It was a defining part in my photographic year and one that moved the iconic location of Mana Pools to the top of my list of favourite safari destinations in Africa. Marlon du Toit and I spent an entire day following these elephant bulls on foot as they went about their business. The light and forest setting makes this magical and has etched this moment in my mind for a long time to come. There's a good chance you've seen this one shared on social media this year. It also got some nice publicity through news syndication as a news story. I captured this on the same morning as the previous photo. 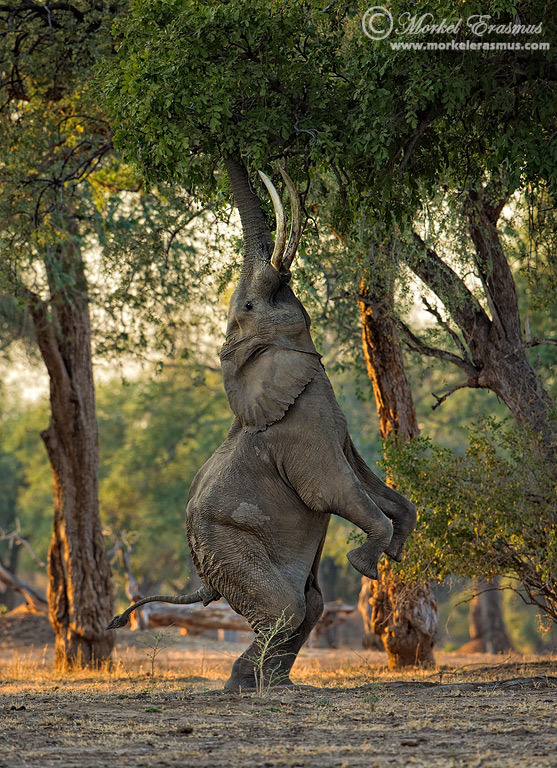 Some elephant bulls in the Lower Zambezi valley have learned how to reach the juiciest, most succulent leaves in the massive trees. Remember that you can join us on safari in Mana Pools in July 2013. You can find more details HERE. 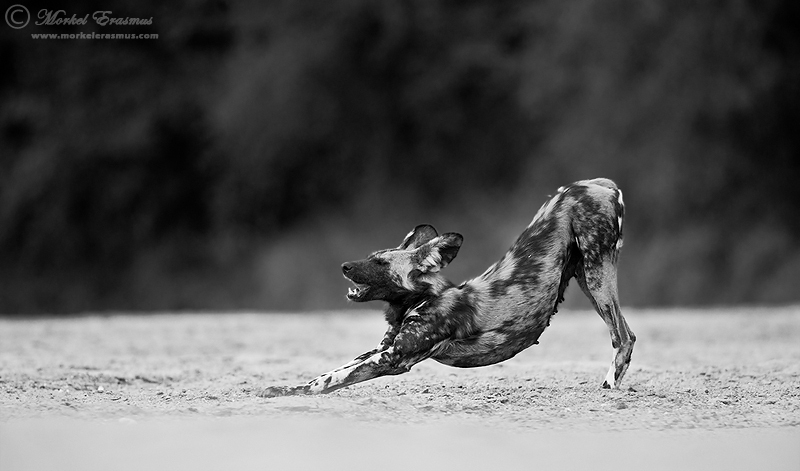 We also spent 2 afternoons in Mana Pools flat on our bellies in a sandy riverbed with a pack of highly endangered African Wild Dogs. Prior to this year I had just about zero usable photos of this species in my portfolio. With fewer than 5,000 individuals estimated to survive in the wild, this species is on the brink of a disaster...and it's a shame as they are fascinating mammals. 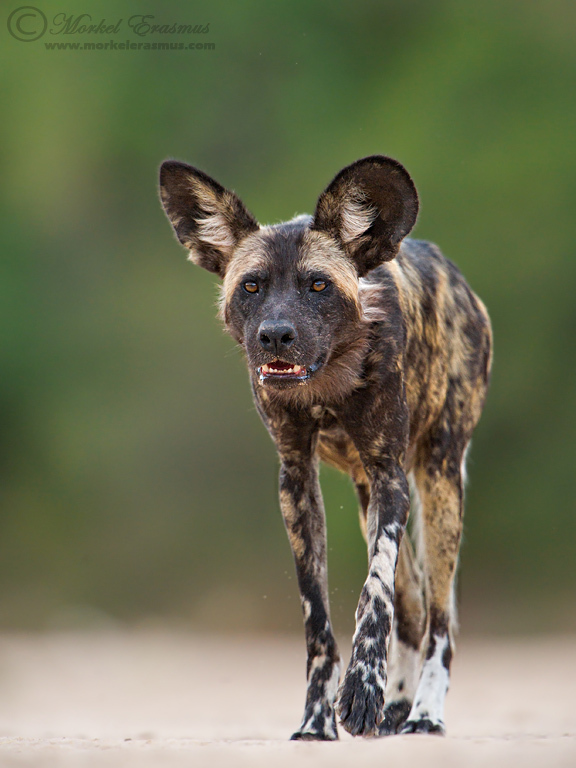 You can find out more about this species and the conservation efforts in Zimbabwe at www.painteddog.org. Not only did we spend some time observing this pack of canines from a safe distance, taking some nice photos...the Alpha Male decided to take a closer look at us on the 2nd afternoon...and came to within 10 meters from us, before plopping down and lying next to us for a few minutes. A totally exhilarating experience that I shall not soon forget! This image is not cropped - it's shot full frame in portrait mode! You can read more about this experience HERE. The next few posts are all about the lions. 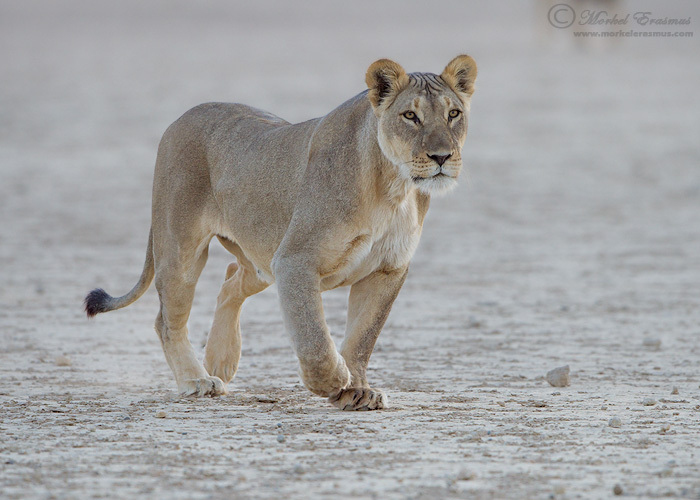 Though the Kalahari is traditionally a great place for viewing lions, I've mostly had average photographic opportunities of them during previous trips. Not during our November trip (which was an unplanned one), which was lion-infested! This is the most regal, majestic and beautiful male lion I have ever seen in the wild. 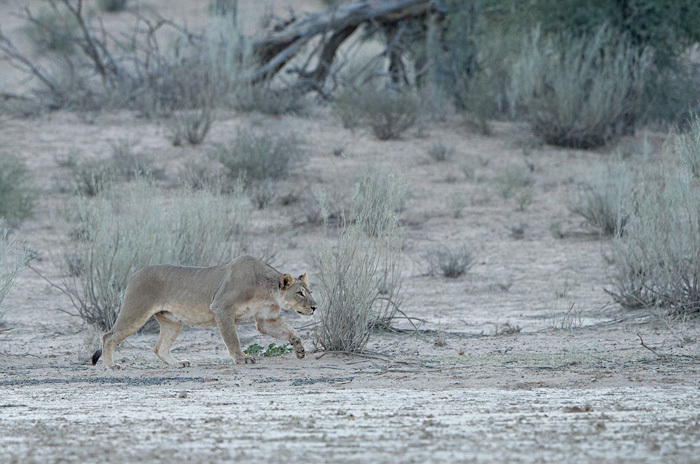 We found him on 3 occasions, and on this morning he was patrolling his territory with a confident stride, roaring loudly with a blood-covered face from the previous night's feed. Look at that specimen! I have seen many many lions in my lifetime...and none of them come close to this guy. 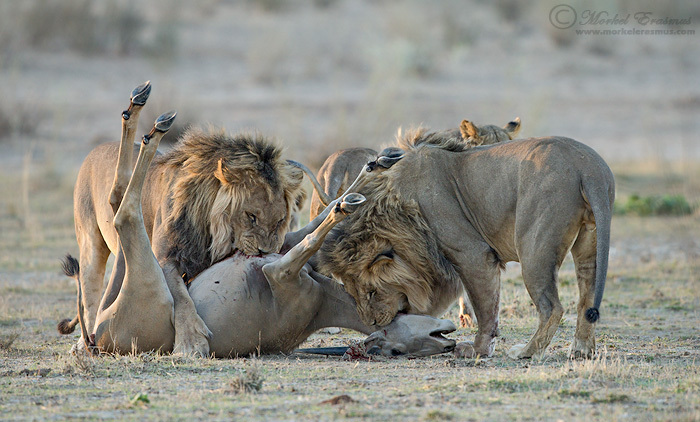 During our recent Kalahari safari I was privy to witnessing (and photographing) an entire lion kill from planning to mealtime. I will do a proper blog post about this sighting soon! This frame was pre-visualised and executed at the only moment that it could be achieved. It's not often that I am able to really capture a whole story and so much context into one shot. The tensely poised huntress, the dawn breaking in the background, the open setting, the seemingly blind eland antelope, the anticipation of what's to come. This frame was taken shortly after the previous one. 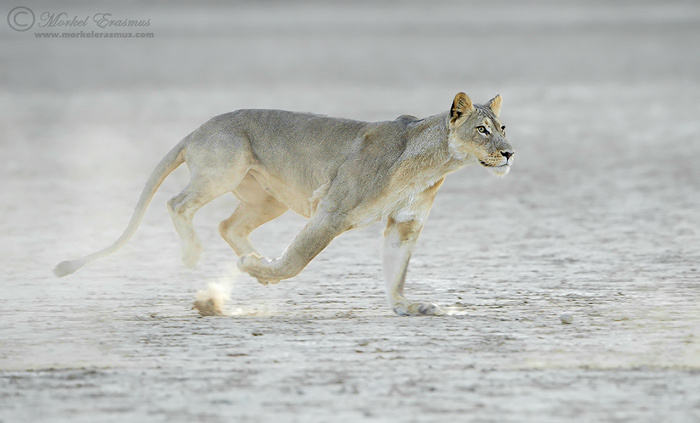 The chase started in a frenzy and I was able to track the leading lioness for quite a few seconds, getting a number of sharp shots. 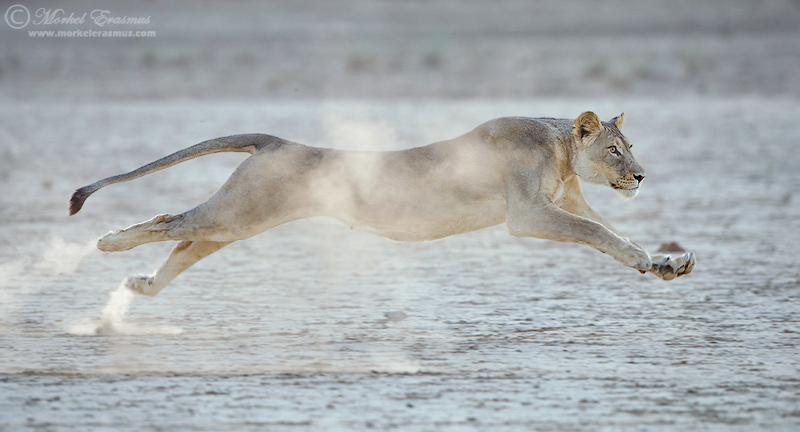 This was my favourite pose, with her running through the dust kicked up by her prey. It's sad to think that these magnificent and iconic cats face a dire future, with their numbers plummeting to a mere 30,000 odd left in the wild. Please check out www.lionaid.org and www.causeanuproar.org for more info on the lion epidemic and how to get involved. 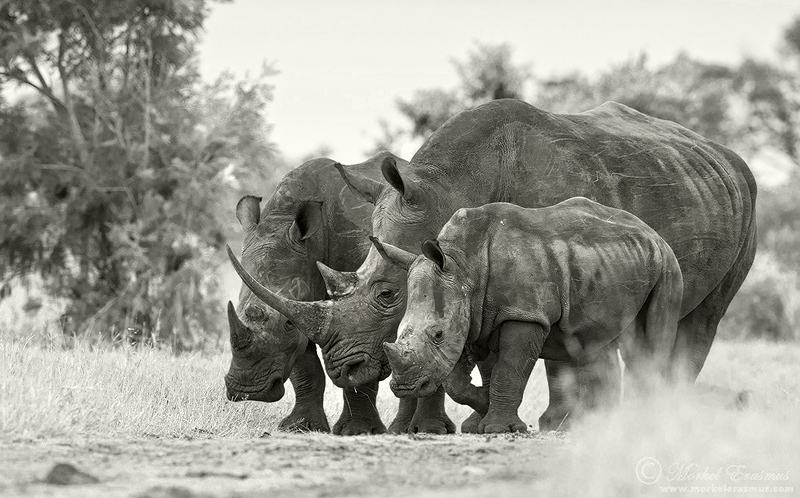 In the light of the recent Rhino Poaching crisis (well, it's not that recent anymore, is it?) I felt compelled to include an image showing these docile giants. A staggering 633 rhinos were illegally poached in 2012 (as at 19 December - stats HERE), almost 200 rhinos more than 2011 and 300 more than in 2010, bringing the total poaching figure since the end of 2009 to a mind-boggling 1414. At the moment it doesn't seem like there is much that can be done to curb this alarming trend, fueled by a newly wealthy Asian market that falsely believes that the horn has medicinal properties. For more info, check out the SAVE THE RHINO and STOP RHINO POACHING campaigns. 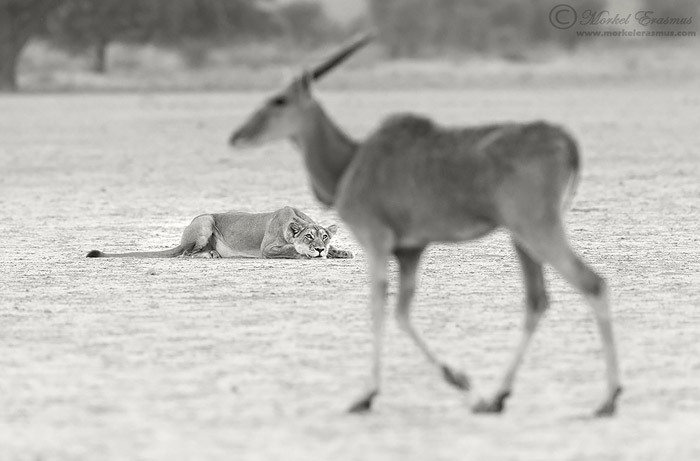 I'm including this one as a bonus because it's a fun moment and to show you that I don't just focus on the large and iconic African species. If you look at last year's post you'll see bigger specie-variety, this year just panned out to be a great year for me in terms of the larger and more "typically African" mammals. There you have it, friends. I would love for you to tell me which was your favourite of this selection - and why! Drop me a comment on this post and let me know. I hope 2013 holds great light and great sightings for you all. One more thing - this year saw another increase in our household! 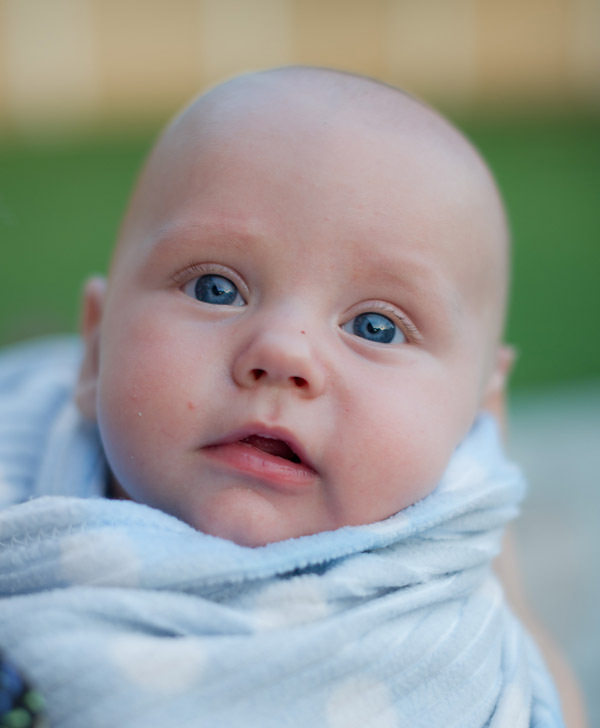 Since I posted a photo of our daughter last year, I better post a photo of our son this year lest they compare these posts years later. This is little Daniël! Keep well, and keep shooting!